FULL SIZE patterns for putting and driving golfers. 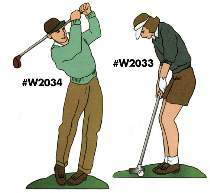 Both golfers can be cut from one 4' x 8' sheet of 1/2" plywood. Putting golfer measures 55"H. Driving golfer measures 57"H.